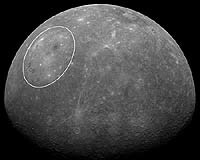 One of the largest craters discovered in our solar system, Mercury’s Caloris basin measures in at over 963 miles (1550 km) wide…easily big enough to contain the state of Texas or all of the Great Lakes! This mosaic image shows the huge crater in its entirety – it’s the light-toned region that dominates the central part of the image. Filled with smaller craters of all sizes, the basin was first discovered in 1974 by NASA’s Mariner 10 spacecraft. 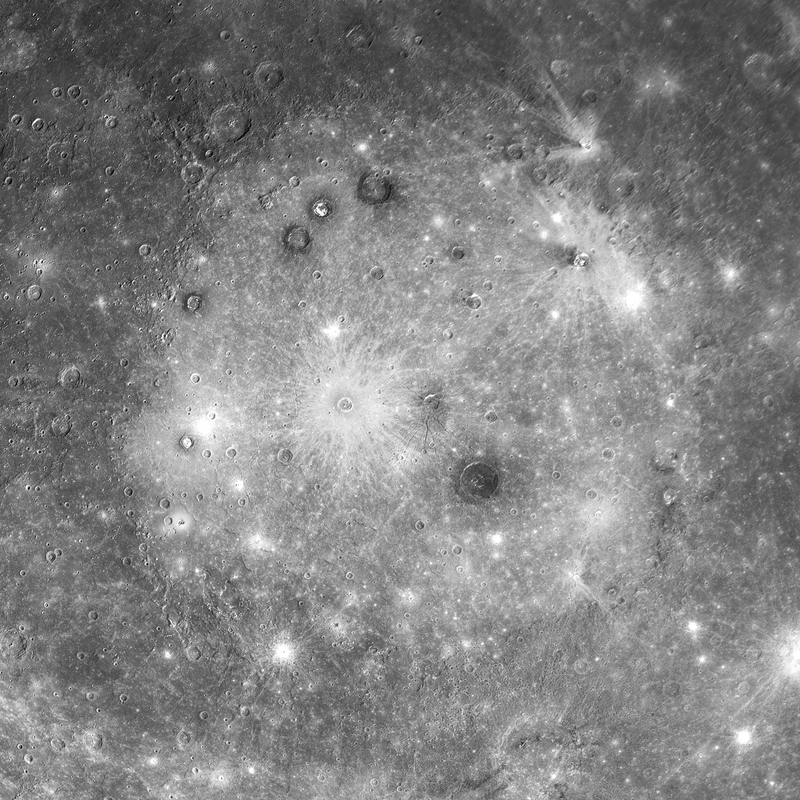 Astronomers use the term “basin” when referring to a crater that’s over 186 miles (300 km) in width and often exhibits multiple concentric rings around the edges. The central region of the basin has several smaller craters surrounded by rayed ejecta blankets and radial fault cracks. This area is called Pantheon Fossae, and the cracks may be older than the craters. The age of Caloris basin is estimated to be 3.8 to 3.9 billion years old…similar in age to some of the largest impact basins on the Moon, it points back to a period of our solar system’s development called the “late heavy bombardment“. The impact that created it was so large that a corresponding region of hilly, grooved terrain exists on the opposite side of Mercury – evidence of seismic activity passing through the entire planet itself! The images that comprise this mosaic were originally acquired in January 2008. Read more about this image on the MESSENGER mission site. Image credit: NASA/Johns Hopkins University Applied Physics Laboratory/Carnegie Institution of Washington. Article originally posted on November 10, 2010. UPDATE 3-8-11: The MESSENGER spacecraft has only ten days left before orbital insertion around Mercury! At 10:40 am this morning the spacecraft began executing its last cruise command, which will continue until next Monday when the orbital maneuvers will begin. If successful, MESSENGER will become the first spacecraft to orbit the closest planet to the Sun. Read more here.